Download (free!) PDF showing the effect of HR 1556 on 15 USC 260ff. What would Year-Round DST look like? Time Zone Report is back! 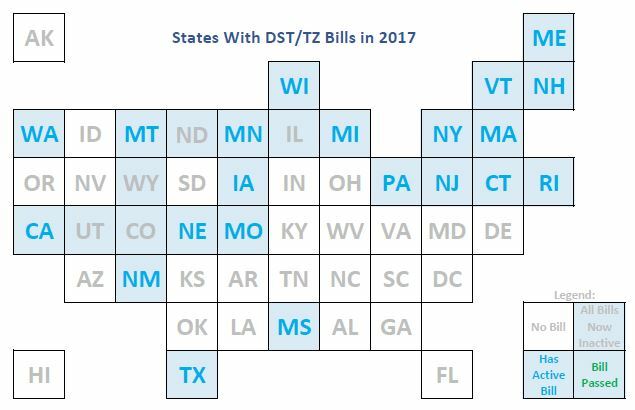 Three DST-related bills are in the US Congress!! Florida Wants Year-Round Daylight Saving Time – Now What? Maybe you were excited about the Florida legislature’s bill about Year-Round Daylight Saving Time which was passed and sent to the governor yesterday. Sorry to burst your bubble, but nothing has changed. Just a quick post here to wrap up 2017. 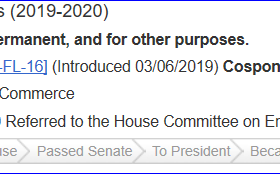 The Montana Senate has approved a bill that would exempt the state from DST after this year, and the bill has now moved over to the House, with a hearing scheduled later this week. If the bill passes, Montana would join Arizona and Hawaii in not Springing Forward in March and Falling Back in November. 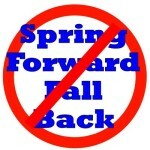 It’s time for “Spring forward” for most US states this Sunday morning, at 2am March 12, 2017. Here is a summary of the bills I know of as of today, March 1, 2017, grouped by type of bill. 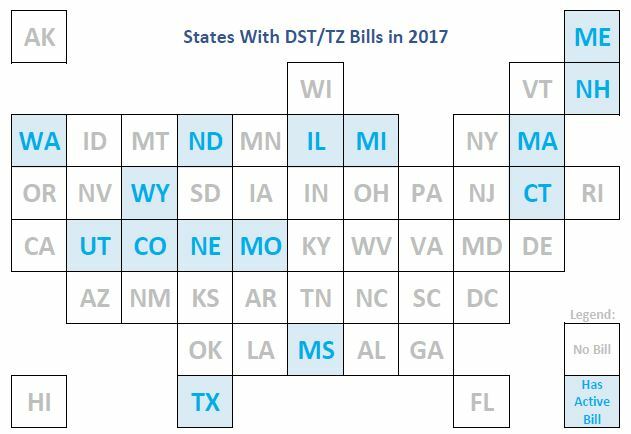 In this morning’s search, I’ve found DST-related bills from two new states, Washington and Colorado, and another bill from Massachusetts, bringing the number of states with bills to 15.